Quickly browse Sarasota waterfront condo communities below. Just click on a condo's photo or title to view the current condos for sale, and also learn more about that particular condo community. Castel Del Mare Condos For Sale | Sarasota Fl. Maintenance Includes: Building Exterior, Cable, Community Pool, Escrow Reserves Fund, Fidelity Bond, Flood Insurance, Ground Maintenance, Insurance Building, Maintenance/Repairs, Manager, Pest Control, Public Insurance, Recreational Facilities, Roof, Tennis Courts, Trash Removal, Water/Sewer. Water Views: Some Water Views. 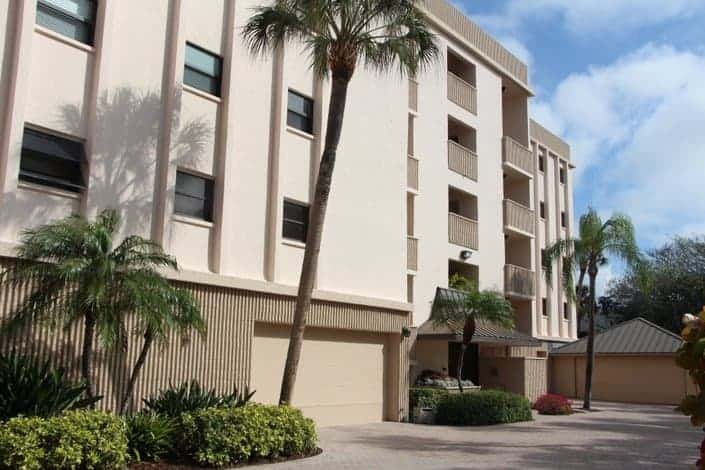 Windward Passage Condos For Sale | Siesta Key Fl. Amenities: Pool, elevators, waterfront complex. Maintenance Includes: Building Exterior, Cable, Community Pool, Escrow Reserves Fund, Fidelity Bond, Flood Insurance, Ground Maintenance, Insurance Building, Maintenance/Repairs, Pest Control, Public Insurance, Recreational Facilities, Roof, Trash Removal, Water/Sewer. White Sands Village Condos For Sale | Siesta Key Fl. Amenities: Heated pool, clubhouse with many social events, marina with water access (waiting list for boat slip) and covered carport parking. Lighted tennis courts across the street, and the #1 Beach in America is walking distance. Waterfront complex. Maintenance Includes: Building Exterior, Cable, Community Pool, Escrow Reserves Fund, Ground Maintenance, Insurance Building, Manager, Pest Control, Roof, Trash Removal, Water/Sewer. Water Views: Across the street from beach. Tivoli By The Sea Condos For Sale | Siesta Key Fl. Amenities: Heated pool, grill area, covered parking, elevator, tennis courts, fitness room, putting green, waterfront. Maintenance Includes: Building Exterior, Cable, Community Pool, Escrow Reserves Fund, Fidelity Bond, Flood Insurance, Ground Maintenance, Insurance Building, Manager, Pest Control, Public Insurance, Recreational Facilities, Roof, Tennis Courts, Trash Removal, Water/Sewer. Water Views: Across the street from the beach. Sunrise Cove Condos For Sale | Siesta Key Fl. Amenities: two community pools, plus north/south tennis courts, billiards, lending library. Maintenance Includes: Cable, Community Pool, Escrow Reserves Fund, Fidelity Bond, Ground Maintenance, Insurance Building, Manager, Recreational Facilities, Tennis Courts, Water/Sewer. Somerset Cay Condos For Sale | Siesta Key Fl. Amenities: Gated community, boat dock with 10K lift & access to Intracoastal. Kayak launch and courtesy dock. 2 car garage, Security entrance has central alarm system, Fitness room, swimming pool, hot tub. Maintenance Includes: Building Exterior, Cable, Community Pool, Flood Insurance, Ground Maintenance, Internet, Insurance Building, Maintenance/Repairs, Manager, Pest Control, Roof, Trash Removal, Water/Sewer. Siesta Sun Condos For Sale | Siesta Key Fl. Siesta Sands Condos For Sale | Siesta Key Fl. Amenities: Gated, two heated pools, pool side gazebo and a beachfront gazebo. Maintenance Includes: Building Exterior, Cable, Community Pool, Escrow Reserves Fund, Fidelity Bond, Flood Insurance, Ground Maintenance, Internet, Insurance Building, Manager, Pest Control, Roof, Trash Removal, Water/Sewer. Siesta Breakers Condos For Sale | Siesta Key Fl. Amenities: Gated, 2 tennis courts, pool, private beach. Maintenance Includes: Building Exterior, Cable, Community Pool, Flood Insurance, Ground Maintenance, Insurance Building, Manager, Pest Control, Roof, Tennis Courts, Trash Removal, Water/Sewer.